While doing her Masters in Geography, Afia ventured into the field of journalism in 1978, lured there by the revival of Pakistan-India cricketing relations after a break of 13 years, and had the honour to become Pakistan’s first female cricket journalist. Cricket and journalist bugs had entered the bloodstream, and geography fell by the wayside, as a long career in the print media commenced. Penchant for going on a road less traveled led to the field of aviation, when she became a member of Pakistan’s first batch of air traffic controllers. However, the pull of cricket, and journalism proved to be too strong, and resulted in her return as the editor of the country’s only English language monthly dedicated to cricket, The Cricketer, and then onto the editing of an aviation and defense monthly, The Wings. Veering off into a related field, she served as the creative head of three advertising agencies over a 15 year period, Blazon, Argus and Blitz-DDB. 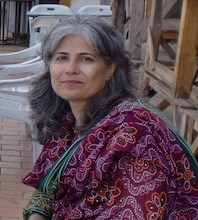 Afia went back to journalism, and edited Pakistan’s first energy sector magazine, Energy Update, and then gained experience of the electronic media by joining Pakistan’s first English language television channel, Dawnnews. Served as the Senior Copy editor responsible for the bulletin, headed the culture desk and was content manager for the flagship show, Daily Breakfast@Dawn. Headed the Education, Communications and Outreach unit of IUCN Pakistan (International Union for Conservation of Nature), and has been responsible for all the activities that fall under these broad heads. Working as an independent media consultant, content developer and media trainer. Is right now working as the Programme Coordinator, Sindh, of the Imran Khan Foundation that is undertaking post flood rehabilitation and reconstruction work.